while i was playing and singing, i heard popping sound the power green light goes dim , I turned it off and waited 20 seconds turned it back on the red lights on channel 1 & 2 came on and turned to green and stay on green even there is nothing plug in. When i plugged in instrument it has no sound from any of all 4 channels. Should I call Bose - If that's the case please give me direct # or information who to talk to. I'm sorry your L1 Classic has stopped working. Yes, it's time to call Bose. 1 Yamaha PSR S950 arranger keyboard. For fund raising party inside restaurant for 350 people ( 35 round tables - 10 people on each ) it's in one big square room - the ban is on stage - dance floor - the rest of space are tables for guesses. - There will be some announcement before dinner start. - The ban will play Soft live music during dinner. any input will help - I don't want to rent or buy anything at this time I like to use what i have for now. You can connect everything as you normally would with the T1 and the L1 Classic. Lets say you connect that to Channel 1. 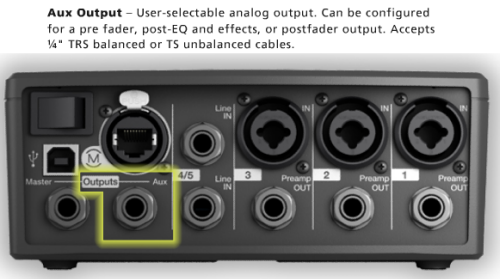 For step 2 T1 Aux Output, you will have to set up your inputs to route them to the Aux Output. Take some time before the show to try it both ways. They should both sound fine. But you may prefer one over the other because of the way you control the volume.